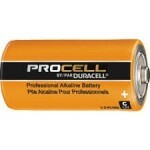 BuyBattery.com is your best source for Duracell Procell alkline batteries. These great batteries have a seven year shelf life. Count on Procell batteries from Duracell whenever top performance in an alkline battery really matters. They are great in wireless mics, flashlight, electronics and any application where a dependable, long life battery is critical to your application. You can depend on BuyBattery.com and all GoodBuyguys.com sites for top quality "satisfaction guaranteed" products and great info.